AuthorMitaliPerkins: Is EMILY OF DEEP VALLEY a Timeless Classic? Is EMILY OF DEEP VALLEY a Timeless Classic? 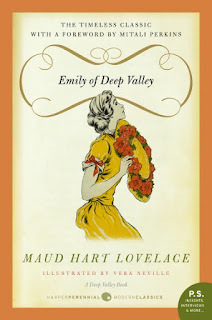 Thanks to everybody who participated in our Cuci Mata ("fresh eyes" in Indonesian) read of Emily of Deep Valley by Maud Hart Lovelace. So does this book stand the test of time? I'll let a group of stellar bloggers make their case. Booking Mama thinks it deserves the label: "Emily of Deep Valley delves into some topics that were pretty much taboo when she wrote this book, namely depression and racism." She Is Too Fond Of Books agrees: "I found in (Emily) a soul sister of sorts, with her unconventional methods of finding her place in the world ... Although I’m hoping you’ll read all the Betsy-Tacy books, this novel can be read on its own and might make a good introduction if you don’t have time to commit to the entire series (make time!)." Diary of an Eccentric definitely thinks it's a classic: "The more I get to know Lovelace’s characters, the more I realize that her books are timeless. It was easy for me to identify with Emily, from her bouts of depression to feeling out of place as friends grow apart — and of course, most of us remember having crushes on guys who didn’t deserve our attention." A Library is a Hospital for the Mind continues the case: "What surprised me was how applicable this story is to readers today. I had no idea when I picked up Emily of Deep Valley that I would be pondering immigration laws, racial and social discrimination, and the like. Who knew that a book written nearly sixty years ago could address and connect the same concerns Americans have today as they had one hundred years ago." And what does Charlotte's Library think about the representation of race and culture in the book? Ethnicity-wise....it was very, very interesting to see Emily and her allies take on the narrow-minded bigots in town who looked on the Syrian immigrants with dislike and distrust. Emily's dream of a tolerant America is a lot less cynical then mine, but that might be my loss...and her final argument for why the Syrians should be embraced, and made welcomed, is one that I could cheer for—Emily wants their differences celebrated, as something that can contribute positively to the whole of American culture. Yay Emily! So that's the one thing I'd change. Otherwise, I think this is pretty much a perfect book! I have ancestors who were known around another river town as “the Syrians.” And like the Syrians in Hart Lovelace’s book, my family was marginalized, called names by the “better” citizens of their town. Their immigration was not welcomed by those who felt the United States had enough people. They struggled with language and social structures and yet lived full lives in “shabby houses that needed paint.” I like to think that someone like Emily might have wandered into my ancestors’ neighborhood, into my ancestors’ lives, to extend to them some version of Emily’s small-town spirit of friendship. And why not? Hart Lovelace’s fiction is based on her early life experiences. Her stories are authentic. Her stories are timeless. It is 2010 and the immigrants living on the fringe of our communities in shabby abodes hail from a different part of the world than Ottoman-controlled Syria. Yet, I’ll bet they hear people whisper derogatory names when they pass. I’ll bet some people feel they don’t belong here; the country is full enough. Still, I’d bet my carriage that despite the majority’s indifference to them, they are living out rich traditions and full lives in the shadow of the American dream like my ancestors once did. And I’ll bet somewhere in America there’s a teenager who, because of the example set by the fictional Emily Webster, is confident enough to step forward make a difference in their lives. As for me? For this, our first Cuci Mata read, I'm going to ask you to read the preface I so gladly wrote for the re-issue. A star debater who uses her elocutionary skills to defend the rights of the powerless? In my opinion, Emily's a female hero who stands the test of time. Secondary non-WASP characters crafted so vividly you feel as if you know them in real life? The Syrian immigrants in this book aren't just foils for Emily's character development. Best of all, the power dynamic goes both ways — Emily is able to help the Syrians, but they, in turn, are able to "save" her. I could go on (as I did in the preface), but I hope you're convinced that this book deserves the "classic" label. Go get a copy and share it with the girls in your lives. I'll let Book Duck have the last word: "Emily is a girl with a spine. The most important thing (she) does with her time, though, is reach out to the community of Syrian immigrants just outside Deep Valley. The townspeople and children give the immigrant community a hard time because of their odd manners and broken English. Immigrants still come to America, and people still forget that poor English is not a synonym for 'stupid.' While idealistic, Emily of Deep Valley challenges readers to rethink their gut reactions to people who are different in manner and custom." If you're in the Boston area, come join us for afternoon tea this Saturday, November 13, at the Brookline Booksmith, where we'll talk all things Lovelace and I'll try to make a case for Emily as a classic in person. Note: If I've missed your review, please add it in the comments. December is dedicated to a Cuci Mata read of L.M. Alcott's Old-Fashioned Girl. Come join us to see if this novel stands the test of time.